If you had told the Angels before the season started that they would be in the thick of the Wild Card race approaching Fourth of July weekend, it’s likely they would have been pleased. Our preseason projections suggested they were an 83-win team and so far they are on pace for 82 wins. They’ve outplayed their run differential and their raw statistics slightly, but they looked like a roughly average team and have played like a roughly average team. What’s noteworthy is that they’ve managed to stay on this pace despite losing Mike Trout to injury more than a month ago. It’s not news that the Angels are as good as we thought they were, but the fact that they’ve stayed on track without the services of the game’s best player sent me searching. With all due respect to Martin Maldonado, Cameron Maybin, Andrelton Simmons, and Eric Young (?! ), it’s the bullpen that has stood out so far, and that bullpen has been led by Blake Parker. Ryan Zimmerman is off to a great start. We’re only 26 games into the season covering 104 PA, but anytime you’re running a .427/.462/.875 line, it’s worth celebrating. Among qualified hitters entering play on Thursday, Zimmerman led the league with a 241 wRC+. This is particularly noteworthy because, measured by outcomes, Zimmerman had a terrible season in 2016. Zimmerman posted a 67 wRC+ in 467 PA last year after many years as an above-average hitter. During the offseason, Jeff Sullivan noted that Zimmerman’s 2016 probably didn’t portend doom. 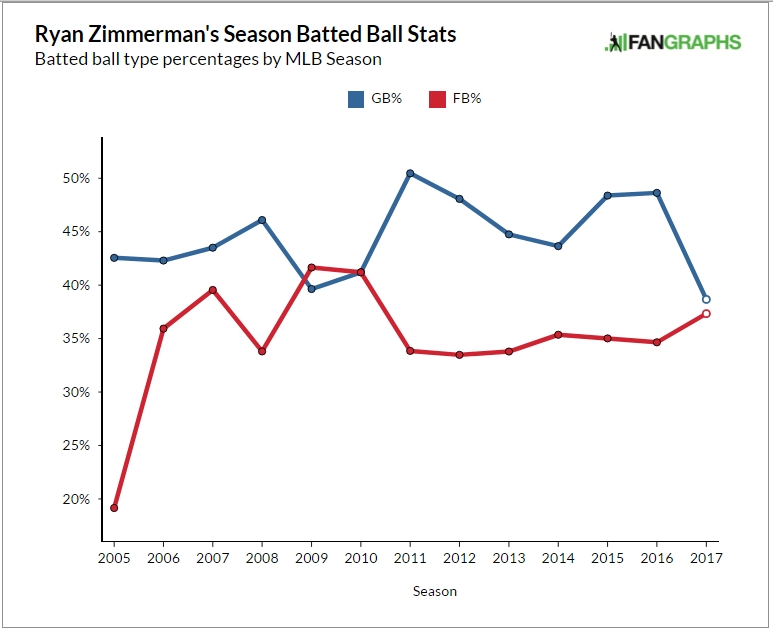 Jeff pointed out that Zimmerman was hitting the ball pretty hard in the air, but he simply wasn’t collecting extra-base hits at a rate consistent with that contact quality. Erstwhile FanGrapher Mike Petriello made a related argument, recognizing that Zimmerman was making hard contact, but that he simply wasn’t hitting the ball at a steep enough angle to turn that hard contact into productive contact. I probably don’t have to tell you where this is going. This season, Zimmerman is hitting the ball a bit harder than last year, 93.6 mph on average vs, 92.5 mph in 2016, but his average launch angle has increased from 9.0 to 11.7 degrees in 2017. But you don’t need fancy Statcast numbers to notice this difference. His fly-ball and ground-ball rates are plenty clear. Zimmerman has joined the ranks of so many players who are trying to hit more fly balls. And at least so far this season, it’s working quite well for him. After two starts and one week of baseball, Sean Manaea has the seventh-worst ERA among qualified pitchers at 7.15. That’s a pretty useless sentence for about five different reasons, but I’m going to rely on it briefly because it’s April and being a baseball writer is very difficult in April. In early April, we’re on the hunt for indicators. Other than health and velocity, it’s hard to find anything that happens in week one that will meaningfully shift your opinion, but we’re all keeping our eyes open for signs of things to come. The data points from April matter, it’s just too early to know if they’re representative of anything. Typically, if a promising young pitcher like Manaea recorded two starts during which he allowed 10 runs over 11.1 innings, we would either brush it aside as a product of growing pains or consider it as a possible indication that something is wrong. In general, it’s not good to give up a lot of runs, even if we’re all in agreement that pitchers don’t have complete control over how many runs they allow. But what’s so interesting about Manaea is that, in addition to what appear to be a couple of rough starts in the outcome department, he’s excelling in two of the pitching statistics that become reliable most quickly. Any reasonably astute fan can take a look at Manaea’s strikeout rate (28.6%), walk rate (8.2 %), home-run rate (0.79 HR/9), and BABIP (.259) to determine that his opponents have stacked all their success into just a couple of weird innings. But while those indicators look good enough to chalk this up to sequencing, there are actually two deeper measures that are quite interesting. 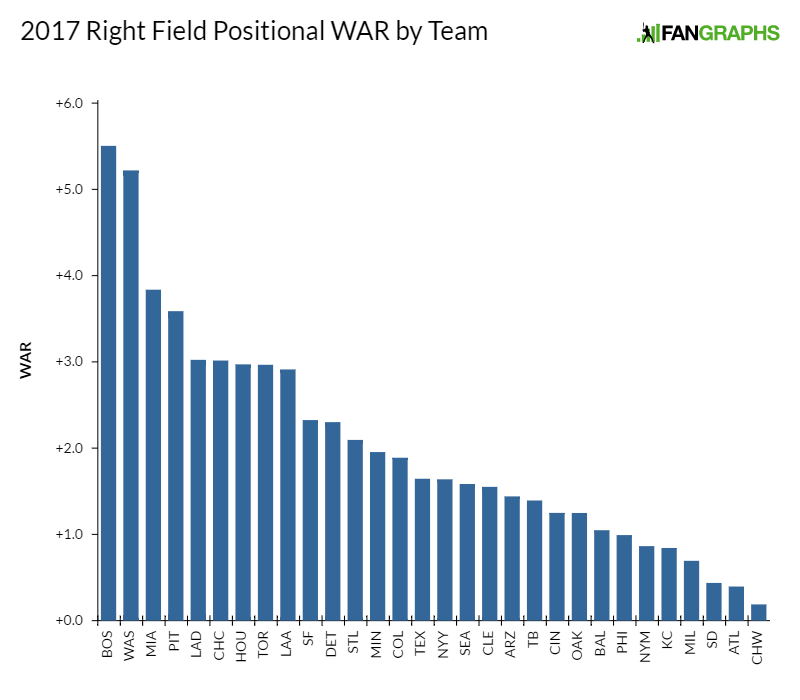 This continues FanGraphs’ positional power rankings. Dave Cameron’s introduction is here. Other installments are available by clicking the links above. Projected numbers are a product of our depth-chart projections, produced by a combination of the Steamer and ZiPS forecasts and our own playing-time estimates. Barring injury, the 2017 season is going to be the 23-year-old Buxton’s first full one in the majors. Under traditional circumstances, there would be a round-the-clock coverage of this budding superstar’s march to the top of every relevant leaderboard. Yet we find ourselves in non-traditional circumstances for a couple of important reasons. To refresh your memory: in the summer of 2013 — Buxton’s first full season as a professional — we were only a year-plus into the Mike Trout experience and we were decidedly not taking it in stride. J.J. Cooper, writing for Baseball America, stoked the fire of comparisons between Trout and Buxton. As baseball fans are wont to do, the crowd took Cooper’s consideration of the subject to another level, and the layman’s impression of Buxton went from “really good outfield prospect” to “might be another Trout.” Buxton built his own hype in 2013, racking up a .944 OPS across multiple levels. In his first full year out of high school, Buxton’s numbers were great and people were giving reports to prospect writers suggesting he was truly elite. Our extremely early 2017 standings projections have the Diamondbacks located a clear step behind the Giants and a couple of notches behind the Dodgers in the NL West, but with a 77-win projection, they’re firmly planted within striking distance. Even if the projections were on the money regarding the club’s true talent, a few wins of random overperformance and a couple of deadline deals could easily vault them into the Wild Card race. The Diamondbacks’ roster is respectable. No one expects them to produce a 95-win season, but you could imagine exciting games in September. One thing about the club that’s particularly interesting going into the season is their starting rotation. The projections put them somewhere in the middle of the pack for 2017, and while you can definitely argue about precise rankings, you probably couldn’t find anyone willing to put them higher than eighth or lower than about 20th. Even if you don’t put much stock into the exact calculations, that generally passes the sniff test. By way of Baseball-Reference’s invaluable Play Index, one learns that there are 39 active pitchers who have started precisely one game in the majors. Most of them have very little big-league experience. Most of them, in addition to their lone start, have recorded a few innings out of the pen during over the course of their one or two years in the bigs. Of the 39 total, 17 have made fewer than 10 appearances in the show. There’s second group of pitchers whose major-league resumes are slightly more impressive. The members of this group have made the one start but have also worked as a full-time reliever for a season or two. This group of 15 pitchers has recorded more than 30, but fewer than 100, major-league innings. Finally, there’s a more interesting group of seven pitchers who’ve made a lone big-league start and yet thrown more than 100 innings in their careers. This is their story. Rockies’ reliever Gonzalez Germen has recorded 144 innings over the course of 129 games from 2013 to 2016. The righty spent two uninspiring seasons with the Mets before a brief stint with the Cubs in early 2015. During the 2015 season, he joined the Rockies, allowing fewer runs since the move. No one would argue he’s been particularly good in Colorado, but in roughly the same number of innings and batters before Colorado and since joining the Rockies, he’s cut his ERA- from 128 to 97 (even as his FIP has gone in the opposite direction). Part of growing up is realizing that some no-hitters aren’t necessarily great pitching performances. Try telling an eight-year-old that the six-walk no-hitter she’s watching is less impressive than a one-hit, no-walk shutout and she’ll look at you like you’re from another planet. If you explain that same thing to an adult, she probably won’t turn off the TV, but will probably concede you have a point. No-hitters have a magic that transcends the actual logic of the achievement. That’s perfectly fine, of course, as one’s enjoyment of an event doesn’t need to correlate precisely with it’s degree of difficulty. But it’s worth considering why the no-hitter is magical. Most of it is probably the name and the history, but I’ll propose another reason: it’s a razor’s edge accomplishment. In other words, as soon as the pitcher allows a hit, the entire thing is over. When Barry Bonds was chasing Hank Aaron, if he failed to hit a home run, there would always be another chance. If a batter falls below .400, he can always bring his average back up. When you’re dealing with an accomplishment based on a zero, everything is exciting because it could be gone at any moment. This is why I was so interested in Chase Utley‘s no-double play season. Every single plate appearance mattered. Well, in preparing last week’s post on Derek Dietrich’s elite ability to get hit with the baseball, I noticed another zero-based accomplishment that’s pretty extraordinary: Coco Crisp hasn’t been hit by a pitch in more than five years. In 2016, Brandon Guyer cemented his role as the king of the hit by pitch. In fact, erstwhile FanGraphs author August Fagerstrom used precisely that title when reviewing Guyer’s exceptional ability to put his person between the baseball and the catcher’s glove. Guyer was hit in nearly nine percent of his plate appearances in 2016 and more than six percent of his plate appearances during his time in the majors. I will save you the trouble of looking it up — both of those rank first in baseball. Yet in his desire to tell the story of Guyer’s superior ability, August failed to mention (maliciously ignored?!) another player who would be considered a king in his own right if not for the presence of Guyer atop this delightful leaderboard. In other words, if Brandon Guyer didn’t exist we would still have someone about whom an article is worth writing. This is that article.